Solvent-free painting in a variety of styles can be done simply using the putty medium. 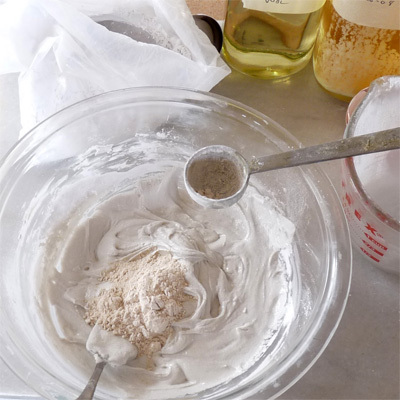 Putty can be simple or more complex in terms of its ingredients. 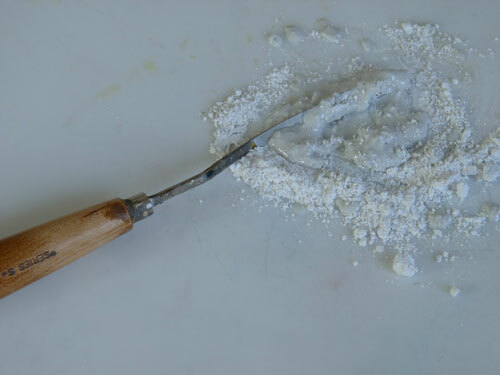 The simplest putty is chalk or marble dust and oil, mixed together to a consistency that works for the painter's style. This pigmentless, full-bodied paint is then mixed into the paint before painting. Beginning to mix. 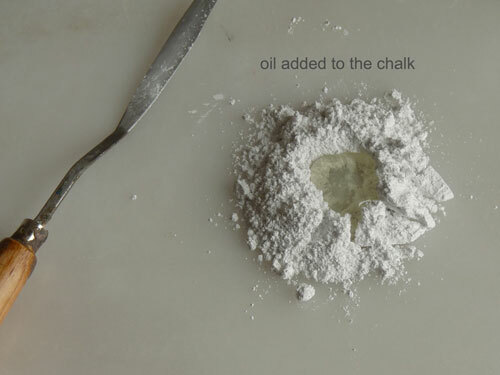 The chalk is not gritty, and absorbs oil readily. A more mobile consistency. This will still make the paint itself more adhesive. A firmer consistency. This will give more of an opportunity for stable impasto. 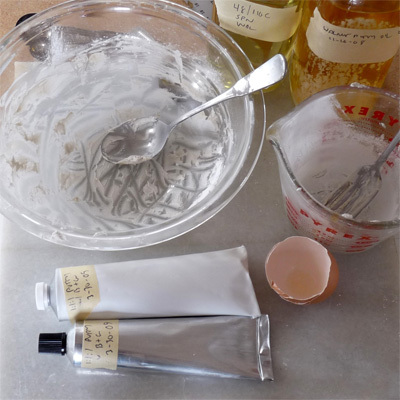 A step-by-step tutorial follows about making a more complex putty from beginning to end. 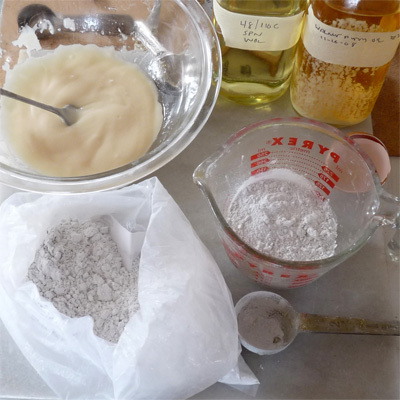 Putty is principally made from stone dust and oil, a few other ingredients come into play in small amounts. The oil in tube paint is raw and makes a relatively weak paint film. The putty oil is therefore engineered to be stronger by using no raw oil. However, thicker or prepolymerized oils need to be used with care in more traditional styles of realism -- at about 5 to 10 percent of the total oil amount -- as they can easily create a paint which is over-saturated and difficult to manipulate. Illustrated here are a variety of oils that might be used in very small amounts. From left: Allback boiled linseed oil, aged a year in the light, a mixture of leaded walnut oils, all also pre-heated, Burnt Plate Oil #7, another pre-heated leaded walnut oil, a pre-heated walnut oil. More information about the oil can be found here. 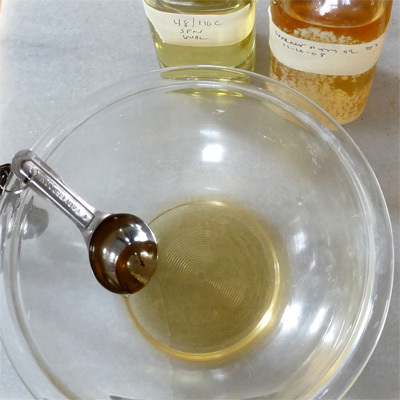 First step, the oil is mixed into the bowl. In this case, I'm replicating a putty recipe that worked out well with a few small changes. The oil can be all thin, in this case the putty will dry matte. Adding small amounts of pre-polymerized oil -- such as sun oil, stand oil, Burnt Plate Oil -- will give the putty more saturation. These seem to work best at about 5 to 10 percent of the total oil. Burnt Plate Oil especially needs to be used in small amounts if control and relatively normal paint handling -- and drying -- are important. All of these factors of course depend on the look the painter wants. Because the putty is inherently stable, its parameters can -- especially on panels -- be pushed much further than other mediums without any technical issues occurring. Next, the egg is broken and separated. The white gets beaten a little, but not enough to make glair. The yolk is reserved in this case, although putty can be made with egg yolk for use on panels. This paint has a soft saturation similar to tempera grassa if egg yolk is added as 5 to 10 percent of the putty. 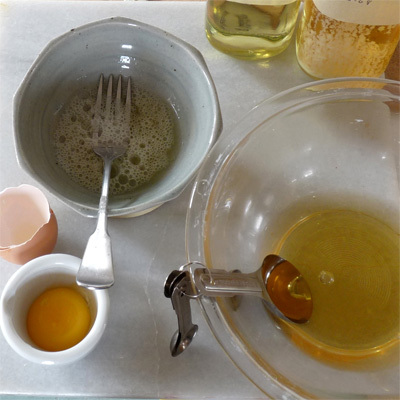 The egg white is added to the oil. 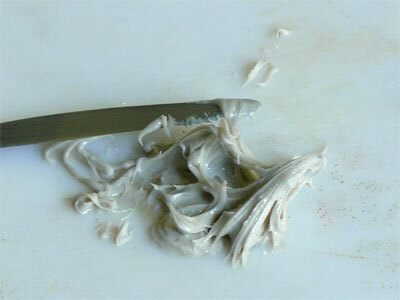 Egg white creates a seizing of the putty which requires more oil, resulting in a putty with more movement. 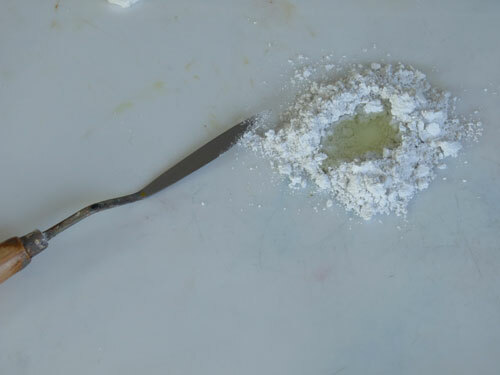 This putty will be used on panels, for use on canvas it would be best to use egg white in smaller amount, at about 5 percent of the liquid totals. Egg is, in any case, optional. 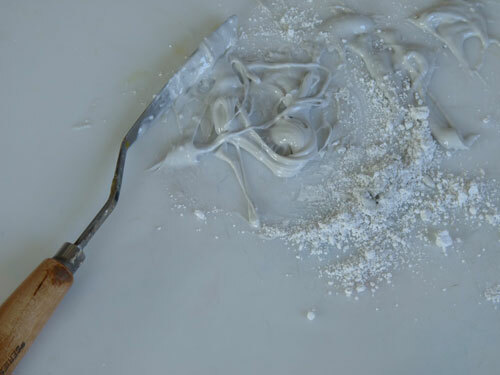 Without egg, the putty is more adhesive and tends to make low impasto or none at all. 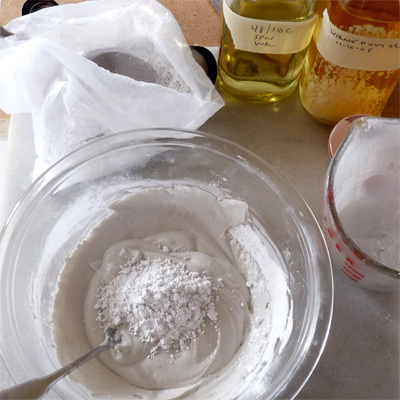 The egg white is mixed thoroughly into the oil. 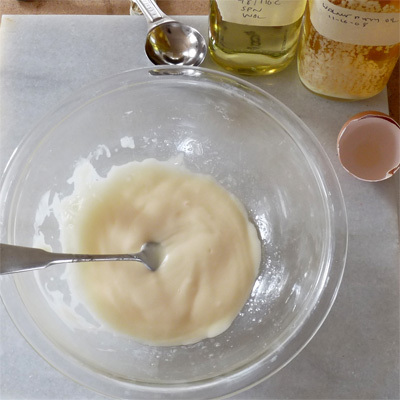 It can form a loose emulsion, as here. Various forms of stone dust can be used in putty, but the principle one is calcium carbonate. The various forms of calcium carbonate all perform a little differently. Chalk is more absorbent, the crystalline forms such as marble dust or calcite less so. Fine chalk is quite glutinous, coarser chalk more mobile. In practice none of these differences matter that much -- they all work, they all stabilize and buffer the paint -- unless you need a certain degree of fineness for the style. For very fine work this can be important. This particular putty is being made with 1/3 cup each of Kremer Calcite, Graphic Chemical French Chalk, and a fine Omya marble dust. }Dry ingredients added to wet. It's always a good idea to wear a particle mask for this. Beginning to incorporate dry ingredients. It looked a little wet so I added more calcite. 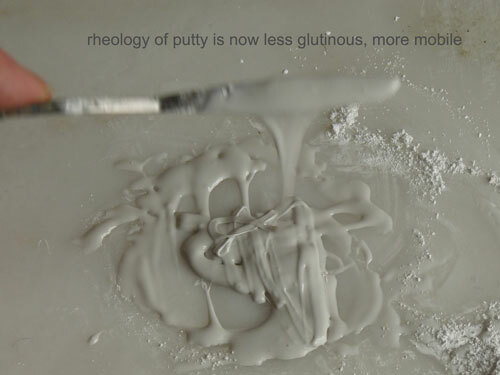 Unless using a quality scale, putty is a relatively inexact science, but one learns more about what various rheologies will do on the palette from experience. 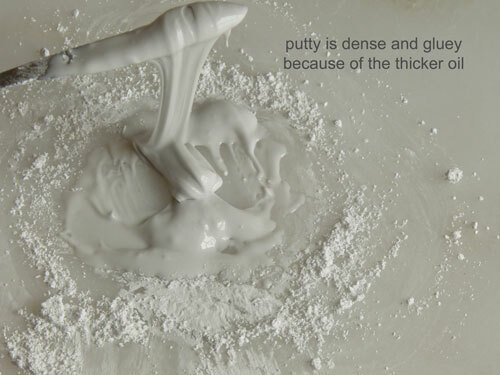 How tight or loose you make the putty depends on how you work and the specific combination of ingredients. I make it on the loose side when it's going in a tube, because it sets up a bit with age. On panels putty can be applied like mortar, but for canvas it can simply be used as an extender and strengthener of smooth paint. 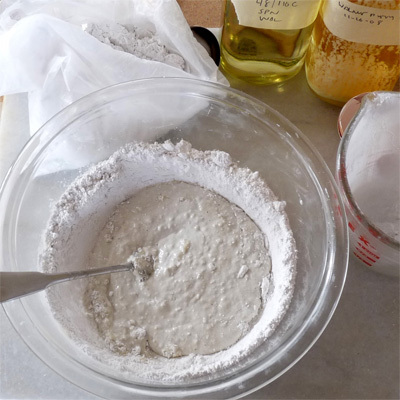 One final ingredient, a tablespoon of bentonite. This complex clay is never very light but even a small amount will make a putty more springy or boingy. Update note, September 2018: All types of clay attract water and may lower in tone somewhat over time even in small amounts. This depends on the amount of humidity the painting is exposed to, how protective the final coating is, etc. For lower chroma or chiaroscuro, this is unlikely to be an issue, but it may bebest to leave clay out of brighter colour schemes. Putting the putty into a large tube. This is not necessary, but ensures long shelf life for a recipe that you like. I'd also recommend working with the putty more informally for a while as just chalk and oil before tubing it, you can cover more conceptual territory quickly this way. The final product, ready to extend and strengthen tube paint. 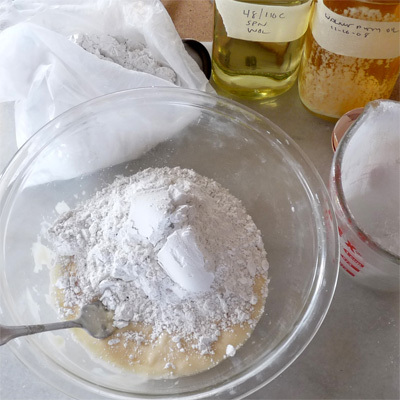 Recipe in this case is: 7T pre-heated and/or leaded oil, 1egg white (or less), 1 cup assorted calcium carbonate, 1 T bentonite (optional, see above note). About half the amount of egg white would be safer on stretched canvas. Update note, September 2018: In terms of film strength, egg white is a weak ingredient. 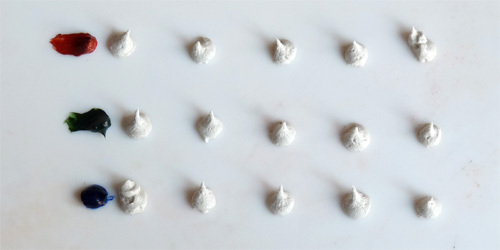 While the other ingredients in the medium are strong, it is safer to keep the amount of egg white small. 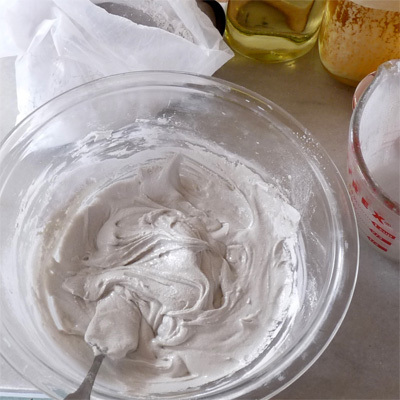 Experience has also shown that it may be best not to use wax and egg white together, or to monitor the amounts very carefully if they are used together, as both of these ingredients contribute to a weaker paint film. Putty recipes tend to continue to evolve with experience, as the paint suggests different ways it might be configured. Enthusiasm for the recipe track may slow down getting to know the material better, however. 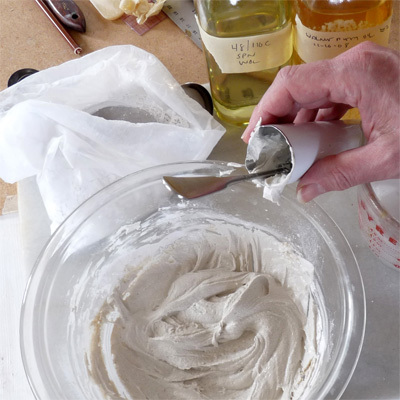 As such, it may be helpful to work with a simple wet-dry mix of chalk and oil on the palette for a time before making up a particular or more complicated formula. One of the things that has been intriguing about working with the chalk putty has been learning more over time about what it can do rheologically when used with hand-refined oil. Here's a look at a simple set of ingredients and what they can do. 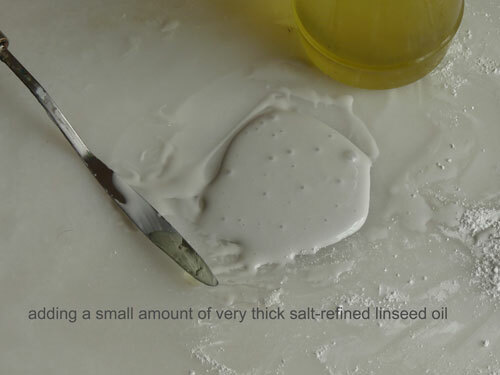 The oil is salt-refined linseed oil that has been thickened in an open glass tray. It's not that thick, but will dry to a gloss in a putty at this density, as opposed to raw oil, which dries matte. First the slightly thicker oil is added to the chalk. The result is somewhat dense and gluey because of the thicker oil. Added to paint, this would be very broad working, hard to move with anything but bristle brushes or a knife. 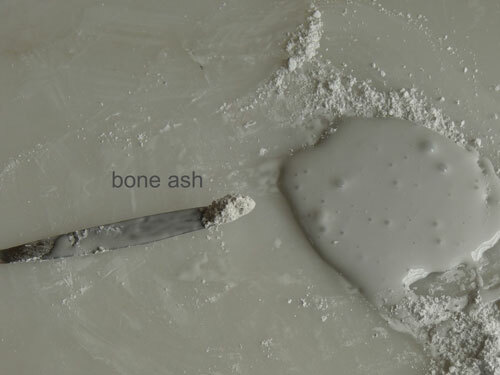 The introduction of a small amount of bone ash, what's leftover when bones are calcined, one of the oldest materials mentioned in painting manuals. 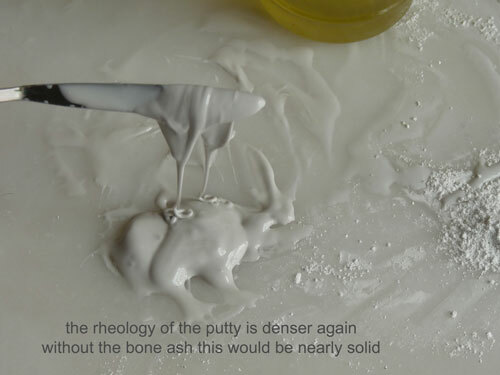 When the bone ash is added, the rheology of the putty relaxes. It is still dense, but now it is mobile, makes fine string, could be used with fine brushes. This mobility can also be reversed somewhat. 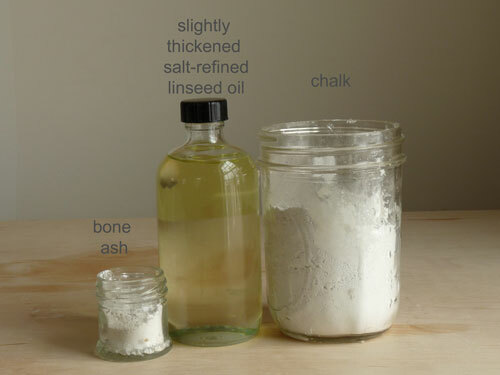 When the salt-refined linseed oil gets quite thick, it becomes a powerful seizing agent for the putty in small amounts. 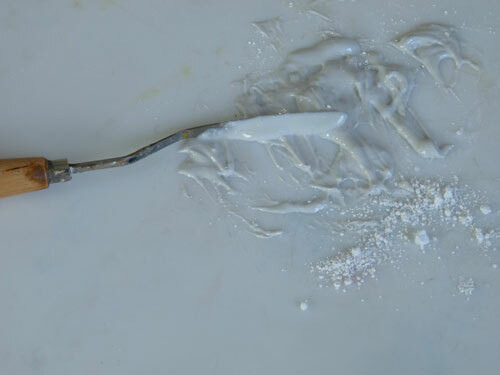 It does something similar here, but the addition of bone ash keeps the putty from becoming a near-solid. This has quite a balanced rheology now between density and movement, would be great fun for painterly realism. So, with very few ingredients, and no resins or solvents, it is possible to create a great many different working qualities for the paint. The key to this is the complexity of the rheologies set up by the salt refined oil, a technique that is at least four centuries old. 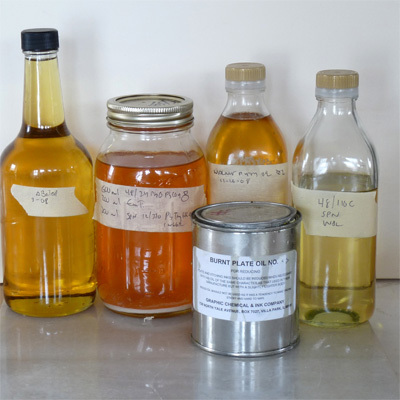 Commercial oils such as stand oil or burnt plate oil induce the opposite behavior: melting and leveling, not thixotropy. Sun oil is a little better, but commercial sun oil is never refined, and this makes it less likely to cause seizing. The system is non-Newtonian on two levels: the solid bone ash makes the putty thinner, and the addition of a liquid oil makes it thicker. This technique may or may not be related to older methods, but all its ingredients have been available for centuries. The bone ash, of course, is not critical, since the putty can always be loosened with thinner oil, but it does introduce a quality of its own. So, when we read about an older painting being made with "chalk, pigment, and oil," the situation may be a little more complex than those words indicate. More importantly, the system is versatile, stable, and a great deal of fun to explore. This oil cannot be purchased, and I shudder to think what our dear friends who manufacture art materials would charge for a high quality oil they actually had to process. 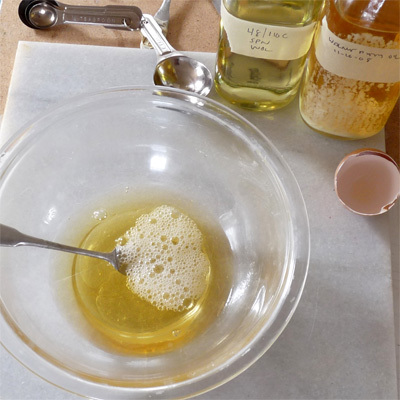 But, flitting lightly over that, if you are interested in making this oil, you can download an updated PDF of the procedure here. This text now includes three other traditional refining methods in addition to the one exampled here. The putty changes color behavior. 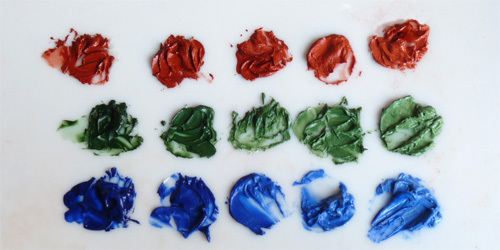 Here are samples of terra rosa, green earth, and ultramarine blue. The samples above cut progressively with putty. While these colors are lighter, they have significantly more chroma than a similar value made with white. If this is making the hairs on the back of your neck stand on end, thank you. The putty brightens the colors, and gives them a lighter, more aerated quality. Using the putty allows a great deal more apparent color to come from a simple earth color palette by sequestering the use of white to specific areas of the painting. This was of course the foundation of many different 17th Century techniques. The putty medium can be configured in many ways. It will make paint which is thin and smooth as well as paint which is rough and broken. It acts both physically and chemically to stabilize the paint film. It will not, however, make you breakfast. Almost all work on this site from the last three years is made with the putty medium and no additional resin. This is an extremely versatile and tough material. More putty process details to be found here. 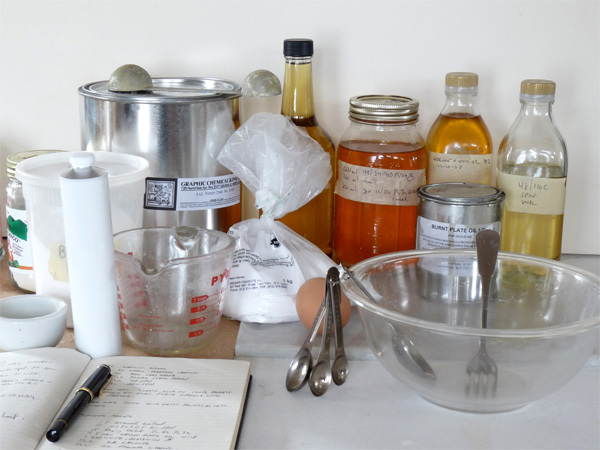 More putty history and instructional text, including a variety of recipes, can be found here. 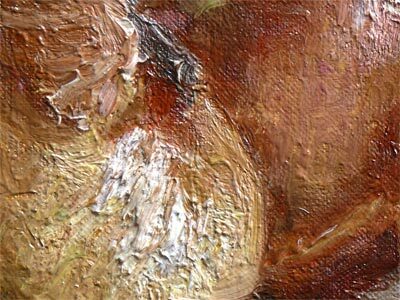 Detail below of alla prima study of onions from 2007 made with a simple chalk-oil putty.